A neckerchief, (from neck (n.) + kerchief ) sometimes called a necker, kerchief or scarf is a type of neckwear associated with those working or living outdoors, including farm labourers, cowboys and sailors. It is most commonly still seen today in the Scouts, Girl Guides and other similar youth movements. A neckerchief consists of a triangular piece of cloth or a rectangular piece folded into a triangle. The long edge is rolled towards the point, leaving a portion unrolled. The neckerchief is then fastened around the neck with the ends either tied or clasped with a slide or woggle. Neckerchiefs worn by sailors are shaped like a square, and are folded in half diagonally before rolling, with rolling occurring from the tip of the resulting triangle to its hypotenuse. Either neckerchief is then placed on the wearer's back, under or over the shirt collar with the ends at the front of the wearer. The rolled ends then pass around the neck until they meet in front of it, where they are secured together, either with a knot, such as a reef knot or a slip knot, or with a rubber band or other fastener (called a woggle or neckerchief slide) and allowed to hang. A slip knot (vs. a simple reef or square knot) will give way if the neckerchief gets caught and is thus less likely to choke the wearer. 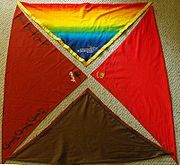 Each Scout group would have a neckerchief of different design and colours. In most countries each Scout Troop uses its own colour neckerchief. The colours are usually the "Troop Colours" which may have a particular historical significance to the troop or to the local community. 1941: Deutsches Jungvolk member wearing the black neckerchief and leather woggle. Young Pioneers in the former Kazakh SSR wearing red neckerchieves. In Nazi Germany, the Hitler Jugend, Deutsches Jungvolk and Bund Deutscher Mädel all wore a black neckerchief as part of their uniform, usually folded under the shirt collar. It has been suggested that it was copied from Scouting,  which was banned in Germany in 1935. Wikimedia Commons has media related to Neckerchiefs. Look up neckerchief in Wiktionary, the free dictionary. 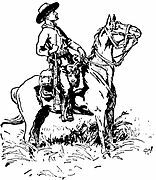 ^ "Online Etymology Dictionary: Neckerchief". Online Etymology Dictionary. Retrieved 1 September 2017. ^ "History of US Navy Uniforms [1776 - 1981]: 4. A Major Influence on Uniforms; The Civil War". ^ "Description and Wear of Uniform - Components - Neckerchief". Navy Personnel Command. ^ "Scouting for Boys (Campfire Yarn No 2)" (PDF). ^ "Scout Association Factsheet: The Origins of the Woggle" (PDF). ^ Jean-Denis Lepage (2009). Hitler Youth, 1922-1945: an Illustrated History. McFarland & Company Inc. p. 57. ISBN 978-0-7864-3935-5. ^ Jennifer Craik (2005). Uniforms Exposed: From Conformity to Transgression. Berg. p. 39. ISBN 1859738044. ^ David A. Law, (1975). Russian Civilization. MSS. p. 314. ^ Kim Dramer (2006). People's Republic of China. Children's Press. p. 124.